Police have confirmed there were no explosive devices on a plane which was diverted to Prestwick Airport. In a note passed to the cabin crew inside a magazine it had been claimed there was a bomb on board. 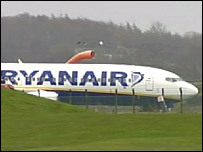 The Ryanair plane was en route from Beauvais Airport near Paris to Dublin with 167 passengers on board. Several incoming flights were diverted to other airports during the incident but the terminal stayed open and other passengers checked in as normal. After a nine-and-a-half hour delay the Boeing 737 finally touched down in Dublin at 2330 BST. Earlier the flight was accompanied to Prestwick by three RAF Tornado fighters, landing at 1420 BST. The passengers were taken to the terminal building for questioning, while a bomb disposal team and sniffer dogs searched the plane. Strathclyde Police later confirmed nothing was found and no arrests were made. By early evening flights in and out of the airport had resumed. A Prestwick Airport spokesman said the flight had been diverted "as a precautionary measure". Passengers on the flight spoke of their confusion surrounding the incident. One told BBC Scotland that the flight captain announced the unscheduled landing. He said: "We got an announcement saying that due to operational reasons we were diverting to Prestwick. "You start thinking - is the undercarriage going to go down, or is it running low on fuel, what's going on here. "He wasn't saying any more, then I looked out the window and saw a fighter plane alongside us." 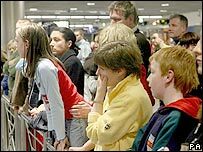 About 70 schoolgirls from St Leo's College in Carlow were among the travellers and there were tears at the airport as they embraced their parents. Most passengers said they were well-treated but Charlie Fitzgerald, from Belfast, accused authorities in Scotland of violating civil rights and using the ordeal as a security exercise. He said travellers were "left like lambs to the slaughter" as the aircraft was searched. "We were left on the plane for two to three hours," he said. "The pilot told us there was a bomb scare and he told us he thought it was a joke. "A couple of fighter jets came alongside us. The crew were superb, and people weren't panicking," he said. "The pilot appealed and appealed to get us off the plane. He said if a real bomb had been on board they would have been blown up to high heaven." He added: "The whole thing was absolutely disgraceful. We had our pictures taken without permission, and statements were taken by police, who had no choice." 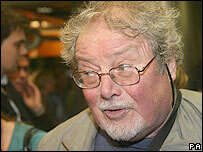 A spokesman for Ryanair apologised "sincerely" for any inconvenience caused to passengers on board the aircraft. but added passenger and aircraft safety was the priority.